I admit it. I’m a sucker for the buzz created by big features like the one Aaron is putting together by dietitians (RDs) who ditch their weekly responsibilities on a Friday afternoon to spend 2 days of sheer bliss above the line of alpine trees in the mountains. You’ve already read Kasey Hutchinson’s posts about the importance of post-exercise nutrition. 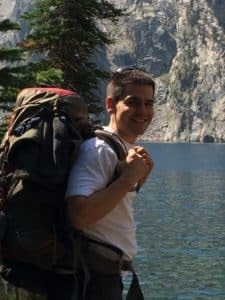 As excited as I was to contribute, my stoke level went into overdrive when Aaron suggested I write about backcountry hunting; “aren’t you interested in backcountry hunting? Why don’t you write about that…”. 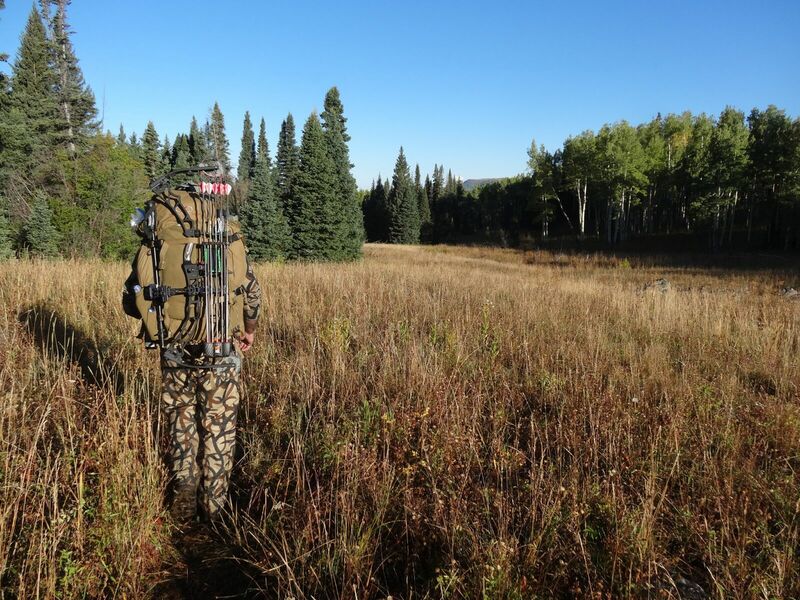 What exactly is backcountry hunting? Pictures this; you’re perched atop a granite slab 5 miles from the nearest road without another soul in sight besides one of your closest compadres sitting a few rocks over from you. You guys aren’t talking a lot besides the nuanced mum’s of “err’sa good buck”. You glance at your watch, GPS, or topo and notice you’re 9,200 feet above the vast ocean several hundred miles to your West. You’re relatively unaware at first, but quickly come to realize you’ve got the richest ticket in the land; a genuine front row ticket to the fight of the year. They’re hard to notice at first, but as you adjust the settings on your binoculars, you’re able to make out two bull elk vying for king of the mountain. A flick of white catches your eye to the left and you notice through the glass of your binoculars two mule deer steady feeding on a patch of shrubs without the slightest inclination that four eyes are on an adjacent hillside watching them, trying to piece together a plan; a plan that if successful, will yield a year’s worth of lean meat for the hunter, his family, and friends. The issue? Well, none really, but many are detoured from pursuing these sights when they realize there’s no road to wild places like these. There’s no (legal) four wheeler road, highway, or train depot. You’re relying on two legs and a lot of resilience to carry you far into the backcountry with all you’ll need to survive and hunt for the next 5 days strapped to your back. It’s easy to quickly see how nutrition plays an important role in not just getting back to remote parts of the wilderness where the deer and antelope (and elk, and fox, and moose, and…you get the picture) roam. All of the calories we take in primarily come from three nutrients: carbohydrates, proteins, and fats. We do get calories from alcohol, but that’s an entirely different topic altogether. Keeping this in mind, let’s take a look at what your average backcountry hunter needs on days spent looking through a set of bino’s (short for binoculars) and on day’s hiking in and out of the high country. 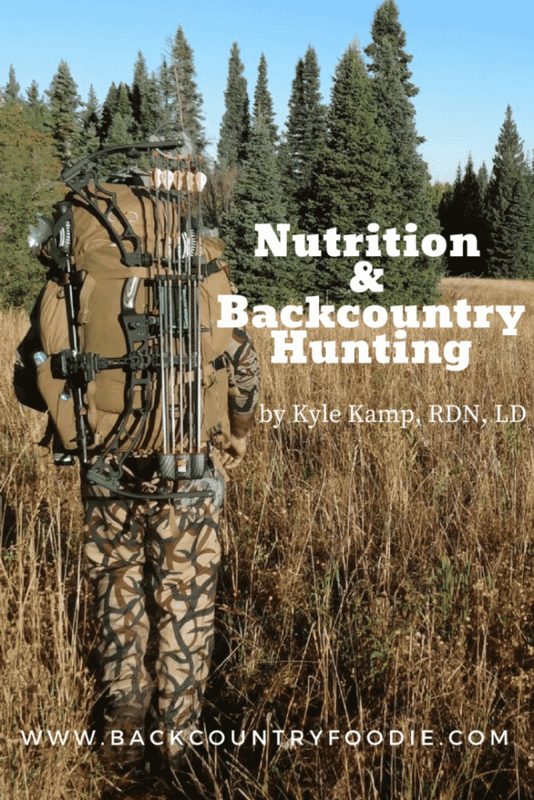 Do a quick search on google for “backcountry hunting nutrition” and after you’ve sifted through the countless pages of supplements for sale, you’ll eventually arrive at pages where folks talk about caloric density and weight. Make no mistake; this is something that is absolutely worth taking into consideration. The next part; however, is a place worth looking at to make some adjustments. The general thought is to make a meal plan built around foods high in fat to provide adequate calories with less weight. Fat, by weight, seems like it would be the most “backcountry bang for your buck” given it has twice the calories provided by either proteins or carbohydrates, yet making this your primary focus is in direct contrast to what science tells us we need on days spent huffing it to the top of a peak 5 miles in the wilderness. Trails? They were great for the first 800 feet, but deer, antelope, and their aforementioned friends don’t party next to a trail. These hikes are far more involved than your average 5 foot wide trail 2 miles outside of town. Make no mistake, these guys and gals are genuine athletes and should eat like one. Calorie needs are very individual, depend on a number of factors, and are heavily dependent on the amount and type of activity a person does. A person first needs to figure out their weight in kilograms, which is simply done by dividing weight in pounds by 2.2. The toughest endeavors can require upwards of 60 calories per kilogram (g/kg) of body weight. Ah, yes. The most feared nutrient since the days we hated fat in the 80’s. I won’t bore you with some intense lesson in biochemistry, but long story short, this is the quickest access to fuel needed on those tough endeavors into, and out of the mountains. If you do feel like nerding out, email me or google “glycolysis”, and “glycogen”, coupled with “high intensity exercise”. Still not buying my spiel? The body, on average, uses between 45-60 grams of carbohydrates during intense activity; roughly 1 gram of carbohydrate per minute of activity! Some estimates go as far as to suggest 90 grams of carbohydrate can be used in an hour for those elite athletes really putting out some effort. To replace all of lost energy-yielding nutrients, science suggests taking in 6-10 g/kg of carbohydrate over the course of the day. You’re likely a pro and can figure out how to space that throughout the day, but there are plenty of dietitians around here more than willing to help if not. Rice, noodles, and couscous are all great backcountry carbs that rehydrate relatively well and can help you go the distance. Knowing had monotonous those salt-laden packaged meals can be, I highly suggest you check out some of Aaron’s meals. I’ve see the nutrition and they’re tough to beat! Now, now, I know what you’re saying, “What about the days spent just looking through a set of fancy binoculars?” Sure, days spent glassing could probably benefit from less carbohydrate than the recommendations we outlined above, but be prepared to get out the Pop-tarts if glassing mode morphs into pack out mode. The king of the nutrition world! If some is good, more has to be better; right?! Wrong. No. Protein has more jobs in the body than I have space to mention here, but we can safely summarize it all by saying protein chief role is repair. Important at the end of the day? Yes. Important in increments during the day? Absolutely. Do you need 200 grams every day? No, absolutely not. Evening meals should be rather protein heavy (30-40 grams total), but also include a good source of carbohydrate and fat. Lower output days (i.e. days spent sitting more than hiking) are certainly an opportune time to include some additional protein for repair after the long hike in. A good aim for protein intake in the backcountry is about 1.2-1.8 g/kg per day. That’s about 130 grams of protein for your average 200 lb man and 70 grams for your average 150 lb woman. Fat is a great source of overall calories with 9 calories per gram of food. It’s important to include sources of fat during the day, but it’s likely arbitrary to put recommendations or boxes and limits around this. The body tends to burn mostly fat at rest, so ditching some of the higher carb foods on days like this is a decent game plan. Using things like the foods listed below is a good strategy to make up a decent portion of your calorie intake on low output days. Aim for oil in evening meals, nut butters on crackers and in oatmeal, nuts in trail mix, chocolate squares to nibble on, etc. To recap; higher carb on high output days is the name of the game for optimal performance in mountain endeavors. You don’t need a ton of protein and it’s going to be best utilized when spaced throughout the course of the day. Don’t focus too much on fat, nor limit it. You’re likely getting the amount you need just by including your normal staples in your meal plan. These plans are built around the premise that folks are going to be asking their bodies to do a lot. It does after all take a lot of exertion and resilience to lose yourself (figuratively, of course) in some of the most remote and wild places on the planet. These are not recommendations for folks working your average nine to five job. Backcountry Hunters and Anglers: A great organization fighting hard to protect the rights to our public lands. These guys are worth checking out whether you’re into hunting and fishing or not. They do an immense amount of work to ensure you’re able to keep exploring the few wild places left. Exo Mountain Gear: A company building solid packs to meet the stringent demands of backcountry hunters and anglers. Take a look through their site. You’ll be hard pressed to not see something that doesn’t interest you; however, if you don’t, they have a podcast that is a wealth of information and worth your time. You can listen to their thoughts at the hunt backcountry podcast. Check out more posts by Kyle about benefits of DIY backcountry meals, carbohydrates, protein and fats, and dehydrating canned and frozen foods.